PacLease helps you maximize resource by eliminating variable truck ownership costs including maintenance, shop labor, technician training, fuel tax reporting and vehicle disposal. 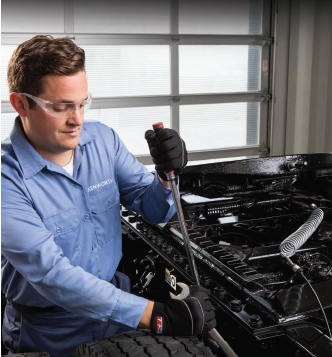 Proven maintenance programs keep your trucks in peak operating condition and our expert service networks allows you to focus on your core business. with the industry’s most advanced trucks spec’d to meet your needs, you can operate at maximum efficiency. In addition, your lease vehicles are equipped with the latest technology maintained by expert, factory trained technicians. Unlike other leasing companies, PacLease does not take a “one-size-fits-all” approach. Trained transportation specialists help you identify the right tools for your application to achieve your business goals more efficiently. 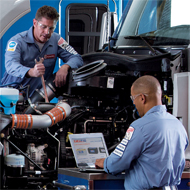 A computerized spec’ing program helps us custom design each vehicle with with precisely the right components based on an analysis of your business needs. We then work with you to bundle custom services that will improve your business operation. We earn our value by increasing your efficiency with the highest quality trucks spec’d for your application and services tailored to your business.